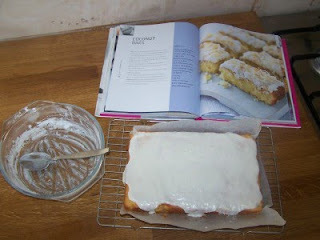 Another winner from ‘The Big Book of Baking. I wanted to bake something quickly this morning for my guys to take on their football trip and I had some sour cream left over which I wanted to use. I made the sticky toffee cake from the same book yesterday for my sister and nephews’ visit but it was eaten before I remembered to take a picture. D’oh! Here it is before I cut it in to bars.